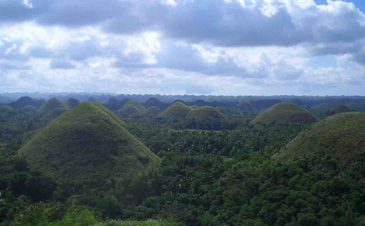 The Chocolate Hills or Chocolate Kisses, Bohol is described by many as Paradise on earth. I fell in love with Bohol the first time I went there three years ago to attend the wedding of a friend's brother. I've been going there every chance I get since then, to what my Boholano friend Raoul Tidalgo and I call "our paradise on earth." 1. The Tarsier - I saw it perched on a tree along the Loboc River made even more famous by Cesar Montano, one of Bohol's pride, in his movie Panaghoy sa Suba. I looked at it eyeball-to-eyeball and that's how I noticed lonely its eyes were, so huge that, for a while, I felt that those eyes would kill me with gentleness. 2. The Chocolate Hills -One of Da King FPJ's favorite settings of his blockbusters, the hills are alive with the whatever sound you can imagine, all those 1,268 mounds (count 'em!). If you have the stamina, try climbing the 200-plus steps up one of them and, from the peak, be mesmerized by a panoramic view of the province. Breath-taking! How did the hills got the name? Give the credit to the Americans who, many years ago, stood transfixed by the natural wonder that reminded them of Chocolate Kisses. Thus, Chocolate Hills. 4. The old churches - Raoul and I visited 14 churches the first time I was in Bohol, completing the Visita Iglesia even if it was the Lenten Season. We lingered a bit in the vicinity of Baclayon Church in Baclayon town, several meters away from it stands the lighthouse where Cesar Montano proposed to Sunshine Cruz at sunset, to the enchanting music of the Loboc Children's Choir. Romantic! 5. The Bohol Bee Farm - Owned and managed by Vicky Wallace, the Farm serves all-organic food, including - would you believe! - Bougainvilla Salad ("Anything that the bees eat is edible," assured Vicky, a retired nurse who worked in the States, now the widow of an American husband) and Camote Bread. To digest an "organic" meal, you can stroll around place and have a close look at the bees of various species, coming from different parts of the country (and Australia). 6. The Peanut Kisses, Ube Jam and Torta - Don't just bring home beautiful memories from Bohol, complete with album-fuls of pictures. Remember to drop by any of the groceries in department stores (BQ Mall - BQ for Bohol Quality - one of them, owned and managed by Raymond Ong who also owns and manages Metro Center which has a cozy hotel at the heart of Tagbilaran City) and stuff your back-pack with as many packs of Peanut Kisses and Torta and Ube Jam as you can. Family and friends back home will love those pasalubongs. Yummy! 9. The Panglao Island Nature Resort - Owned and managed by Raymond Ong, this resort is another haven for weary souls from the big city. If you're looking for a place so quiet and so serene that you can feel your heart gently beating and yourself thinking, with only the sound of the wind rustling among the trees, this is the place for you. Your muscles grown tired? Walk to The Spa nearby. Or take a swim or do a lap or two at the Olympic-size pool. Or run to the beach just beyond your cottage. The resort's new feature is the just-opened Verdant Pavilion which is a perfect venue for concerts (Sitti was the first to hold one there; and, if negotiations push through, Martin Nievera just might do a Valentine concert there in February next year, keep your fingers crossed!). For inquiries, call (63-38) 411-5875 or 502-2451.